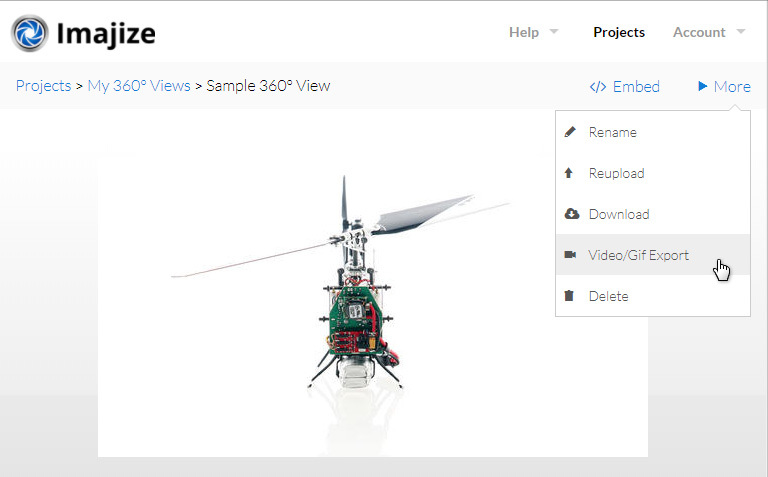 You can now export your 360 spins as animated gifs and high-resolution MP4 videos. A lot of services like Amazon, Facebook, and eBay don't allow interactive images to be displayed in their closed environments. Export an MP4 video file. A link that opens a new web browser window with the interactive spin inside. First log in to your account and navigate to the project you want work with. Open the view that you want to export. Now click "More" in the top right corner and choose "Video/Gif Export"
Now click "Animated GIF" to see the export options. 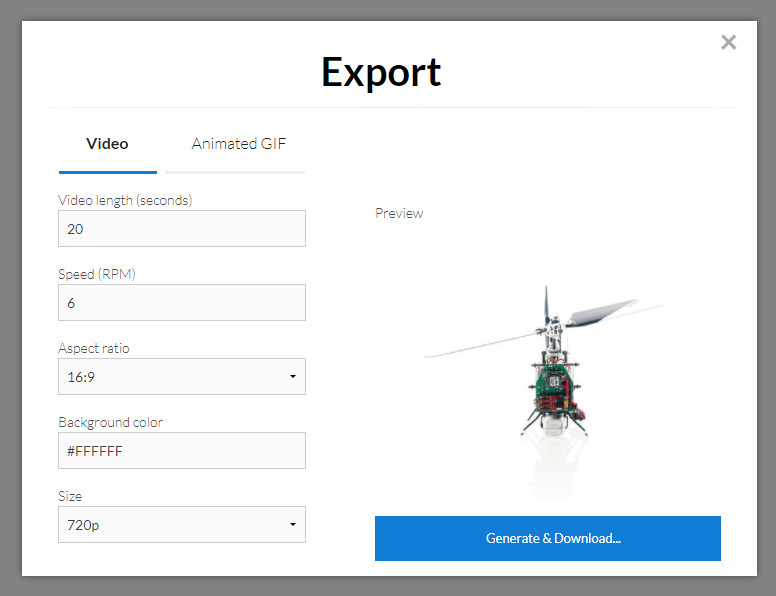 Now you can adjust the rotations per minute (RPM) and set the height and width. Finally click "Generate & Download" and wait a few seconds for it to process. 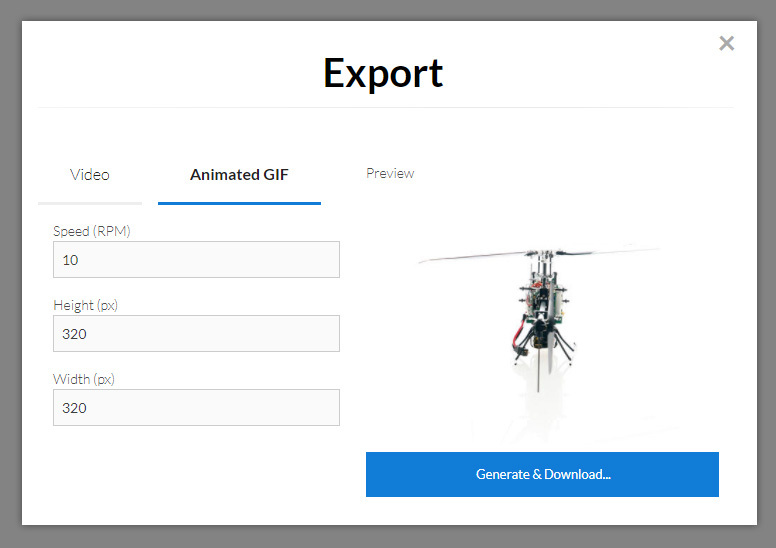 The GIF image will automatically start downloading when it is done. For now the maximum height or width is 640 pixels. The aspect ratio will match the aspect ratio or the images you have uploaded. The width will automatically adjust once you set the height and vice versa. If you need to change your view from a rectangular format to a square format, for example, go back to your project and choose "More --> Reupload" and upload new images. You could also trim the gif using Photoshop. A full 360 rotation uses the same number of images regardless of the RPM setting in most cases. If you uploaded 30 images then the Gif will attempt to show all 30 images. Frames will begin being dropped only when you reach very high RPM speeds. The maximum RPM is 1000. Savvy Photoshop users can open the Gifs in Photoshop and customize the views further. You can drop every other frame to reduce file size or adjust the number of loops as needed. For scaling or color correction in Photoshop we suggest exporting at the maximum size (640 pixels), setting your color mode to RGB and then apply the change consistently across all frames. Scale the image down as a final step after making the changes to preserve image quality. Set the video length in seconds. The animation will rotate repeatedly throughout the duration of the video. Experiment with the RPM speeds to fit your desired behaviour. Now choose between keeping your original aspect ratio or exporting in the widely adopted 16x9 aspect ratio. You can choose a background color for any pixels that exceed the bounds of your original images. If you are using transparent PNGs (not advised) then your chosen color will fill the entire background area. 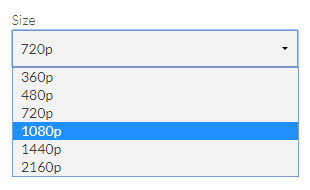 Next, choose the width of the final video and finally click "generate". It may take a few minutes to process the video . Leave the browser window open and it will automatically begin downloading once it's ready. The "popup" option can be found on our standard Embed screen. We have covered 360 embedding options extensively here.